A grain of sand by itself is not intimidating or necessarily powerful. But put those grains together, and you get glass, you get beaches, you get landscapes. In the case of schools in Lofa County, Liberia, they get school books. 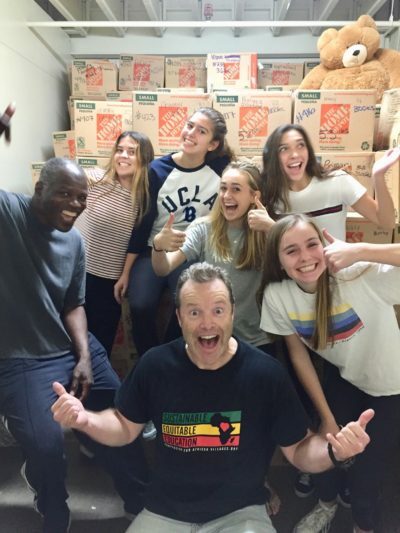 The effort to gather books for the Liberian schools was a collaboration of two rotary clubs (including La Mesa Sunrise Rotary), a Liberian refugee who is now a college student, a middle school student, a college nonprofit, and even two charities on the East Coast. Groups that separately could make a small impact globally, but together have brought almost 70,000 books weighing more than 34 tons to Liberian schools. “Providing quality textbooks among other things will help equip the next generation of leaders in Liberia for different disciplines. Yes, in textbooks, there is knowledge and knowledge is power,” said Benjamin Kettor. He is the grain of sand that brought the East and West Coast charities together for this project. These books are specifically being brought to schools in rural areas with less opportunity than some of the larger cities. Liberia is located on the West African coast, between Sierra Leone and Code d-Ivoire. It was the site of one of Africa’s bloodiest civil wars, according to Global Security, with more than 250,000 casualties and a million displaced refugees. In the two wars between 1989 to 2003, 80 percent of schools in the country were damaged or destroyed, according to the United States Agency for International Development. It was during the second generation of that war that Kettor had to flee the country, emigrating to the United States more than a decade ago. It was also during that time that Robert Saah’s father, a high school principal, was brutally murdered: right in front of his family. In the chaos, three of the kids ran away into the jungle and eventually ended up living with Saah’s grandmother. Saah, his mother, and other two siblings fled to Sierra Leone, where they found temporary housing in a primitive refugee camp. After several years, a traveling minister met the Saahs and arranged for them to be flown to San Diego, where they knew no one. However, unbeknownst to them, the Sunrise Rotary had asked the International Refugee Committee for one more refugee family that they could assist. The Saahs were paired with their club; so in 2003, five Rotary members were there to greet them when the Saahs exited the plane at Lindbergh Field. “They arrived in T-shirts, shorts, go-aheads, and that was all – no baggage,” La Mesa Sunrise Rotary member Bill Pogue recalled. Sunrise helped the Saahs get set up in a one-bedroom apartment and assisted them in making connections in the city. Now, 15 years later, the family is still friends with the Rotary club, the sons are graduating from Mesa Community College, and almost the whole family are American citizens. But over in Africa, Liberia was rocked again by tragedy in 2014, when the country was the start of the Ebola epidemic. The Centers for Disease Control and Prevention stated that there were 10,672 Ebola cases and 4,808 deaths in Liberia during the outbreak – more than 40 percent of the global Ebola death toll. “During each of these tragedies, the Liberian school system was greatly affected there by making education difficult and for some kids impossible. Teachers barely have textbooks to teach, not to talk about students. (There were) no libraries and textbooks for students to enhance their educational dreams,” Kettor said. It was during the second generation of that war that Robert Saah’s father, a high school principal, was killed. Saah and his remaining family fled to Sierra Leone, eventually emigrating to the United States in 2003. Kettor was also part of the diaspora, emigrating more than a decade ago. Liberia was rocked again by tragedy in 2014, when the country was rocked by the start of the Ebola epidemic. The Centers for Disease Control and Prevention stated there were 10,672 Ebola cases and 4,808 deaths in Liberia during the outbreak — more than 40 percent of the global Ebola death toll. “During each of these tragedies, the Liberian school system was greatly effected there by making education difficult and, for some kids, impossible. Teachers barely have textbooks to teach, not to talk about students. [There were] no libraries and textbooks for students to enhance their educational dreams,” Kettor said. So here in San Diego, Saah began to envision sending resources back to Liberia. “It is my dream to bring books and school supplies back to my home country. This is a tribute to my father,” Saah told The Mesa Press, newspaper of Mesa College, where he is a student. Through the Robert-Massaquoi-Foundation he started, Saah recruited the efforts of Richard Makau and the El Cajon Sunset Rotary; La Mesa Sunrise Rotary, who had sponsored him as a refugee; and his “Uncle Ben” Kettor, who was living in Maryland at the time. Sunrise brought on board Compassion for African Villages, a charity started by the late San Diego State University student Tsitsi Mutseta to help Zimbabwe orphanages and continued by Professor Mark Wheeler and his wife Hart. Compassion then incorporated the efforts of now-12-year-old Lily Alba, who had been collecting books for a primary school in Zimbabwe since she was in kindergarten. The grains of sand haven’t finished piling yet! Kettor brought the Rotary Club of Johnson City, New York, and Orphan Cry International on board, who both contributed financially to the project. Kettor became a liaison between the United States and a team of partners, including We Care Foundation, in Liberia. Orphan Cry also sent a volunteer team to Liberia to help with book distribution. That doesn’t include the scores of schools and volunteers who actually donated books and helped sort them here in San Diego. “It’s an incredible team — no one sector can take the credit,” Hart said. 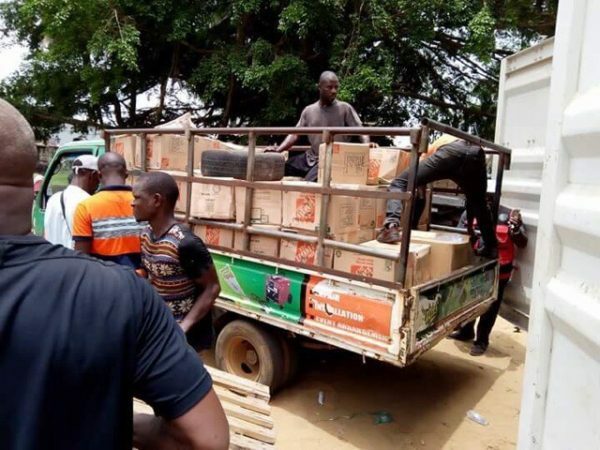 At this point, two containers of books have been shipped to Liberia. The first, containing 33,913 books weighing 40,547 pounds is finishing up distribution now. Saah and his collaborators started at the capital, Monrovia, then moved on to the Foya District and neighboring cities. This has been Saah’s first time back in Liberia since leaving in 2003. The second container, containing almost exclusively used books from the Santee school district, just set sail last month. It was filled with 36,031 books weighing 28,239 pounds. The goal for Compassion for African Villages, Hart said, is to continue the book collecting, but focus in on schools discarding older edition textbooks. 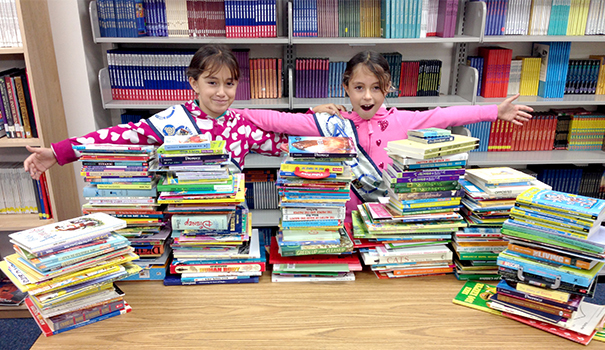 If the book drive team can sort books on site, that can eliminate the need for stateside storage — a $5,000 expense. Compassion also hopes to expand book distribution to other African countries, like Zimbabwe, and make the project more sustainable. The drive is looking for help with funds for storage and transport, and volunteers to assist in sorting. For the latest updates on the book drive, including pictures from the current distribution, visit the Compassion for African Villages Facebook page. You can also email info@alexandrahart.com or call Mark Wheeler at 619-582-5893 for more information.